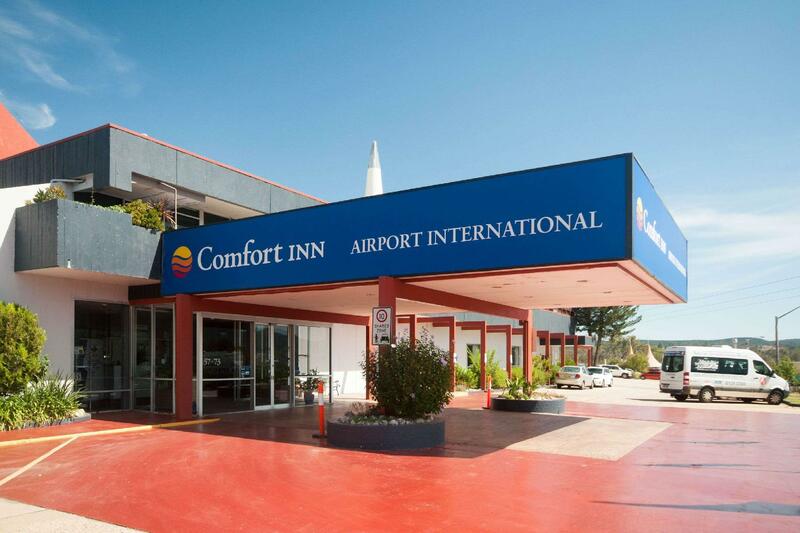 عندما تزور Queanbeyan, ستشعر أنك في بيتك في Comfort Inn Airport International الذي يقدم لك إقامة متميزة و خدمات عظيمة. يقع الفندق على بعد 15 km من مركز المدينة، ويؤمن الوصول إلى أهم مراكز المدينة. سوف يعشق النزلاء موقع هذا الفندق، فهو قريب من أهم المعالم السياحية في المدينة كمثل ‪Molonglo Gorge‬, ‪Burbong Station‬, ‪Riverside Plaza‬ . إن Comfort Inn Airport International حريص على توفير الراحة للنزلاء، فلا يوفر الموظفون جهداً في تقديم أفضل الخدمات وضمان حسن الاستقبال. يقدم هذا الفندق العديد من الخدمات الكفيلة بإرضاء أكثر الضيوف تطلباً. لقد جهزت هذه الإقامة الفندقية بعناية فائقة لتوفر مستوى عالي من الراحة. في بعض الغرف يجد النزيل مكيف هواء, تدفئة, خدمة الإيقاظ, مكتب, ساعة منبه. سواء كنت من محبي الرياضة أو كنت تتطلع لتفريغ عناء نهار صعب، ستجد خدمات ذات مستوى عالي بانتظارك كمثل مركز للياقة البدنية, ساونا, حمام سباحة داخلي, ملعب تنس, بلياردو. 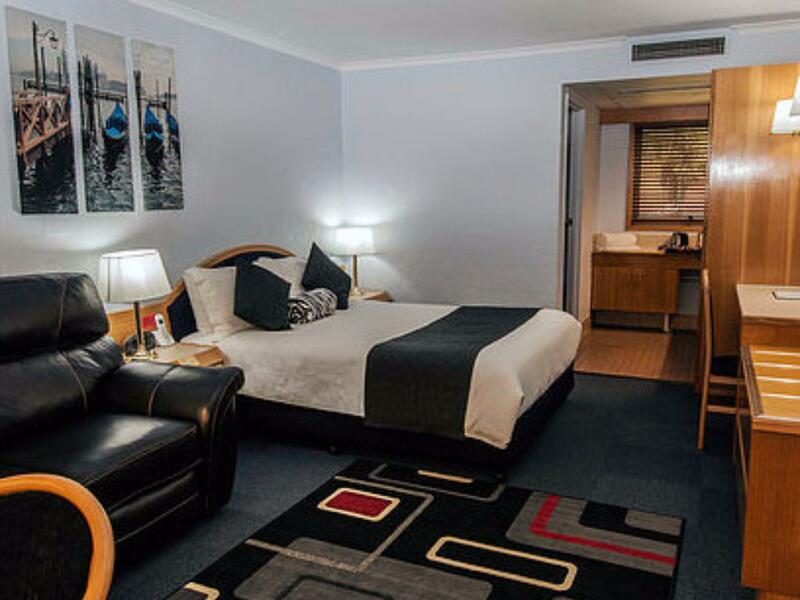 مهما كانت دواعي سفرك فإن Comfort Inn Airport International هو خيار ممتاز لإقامتك في Queanbeyan. The restaurant was not open on Sunday night. High labour costs prevented rooms from being cleaned and made available for rehire on Sunday (that's what we were told). Restaurant not being open on Sunday was not too bad - plenty of food options in the area if you can drive there easily. Close to Canberra airport. This motel was good value for money. Very quiet, no road noise, and a beautiful atrium in the centre of the motel made you feel relaxed and calm. The best breakfast value around. For $10pp you get a hot breakfast as well as the continental if you so wish. 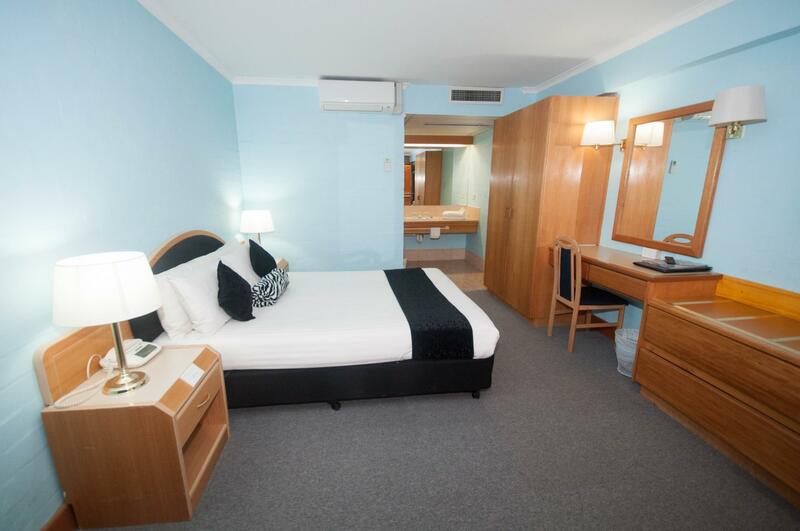 Located only 10 from Canberra Airport good location. It's was lovely, nice and quiet. Could do with some maintainance. Little cosmetic things like beds need replacing as springs poking through. I would recommend people not stay here, the room is basically a redone office and the whole place smelt of mold. I walk into the room , went to the bathroom, pick up my bag and walked out and booked up the road....i have never done that! the place needs a huge clean! We only stayed one night and flew out the next day. Didn't eat in the hotel so can't comment. I was looking forward to our stay, and at first impression everything was great. However the lovely smell in the rooms when you first walk in becomes very over powering after an hour or so, and personally I was extremely upset to have a glass of water and taste chemicals on my glass. When I smelled the glass it smelled of the same chemicals the room smelled like, I have to assume that housekeeping just wiped the glasses in the room with the same rag that had cleaned with instead of placing clean glasses. When I went down to reception to ask for clean glasses, the receptionist was a little rude about it, but did get me the new glasses. Other than that we enjoyed our stay, the bed was comfortable and the shuttle service to the airport the next morning was on time and the driver friendly. I probably would not stay there again though! Utilised the restaurant but was not overly impressed. Think there should be key or electronic access to the access door near the car park for better security. The atrium needs a facelift (eg clean spires ceilings and wash plants). Staff members were very helpful. Gave me a map to assist with directions to Canberra Stadium also. I had trouble picking up the wireless signal, but overall I think the hotel is well located, close to the airport and not far from the city centre. The room was clean. Whilst the shower was in the bath the water pressure was great. It had good bathroom bench space with a good light. 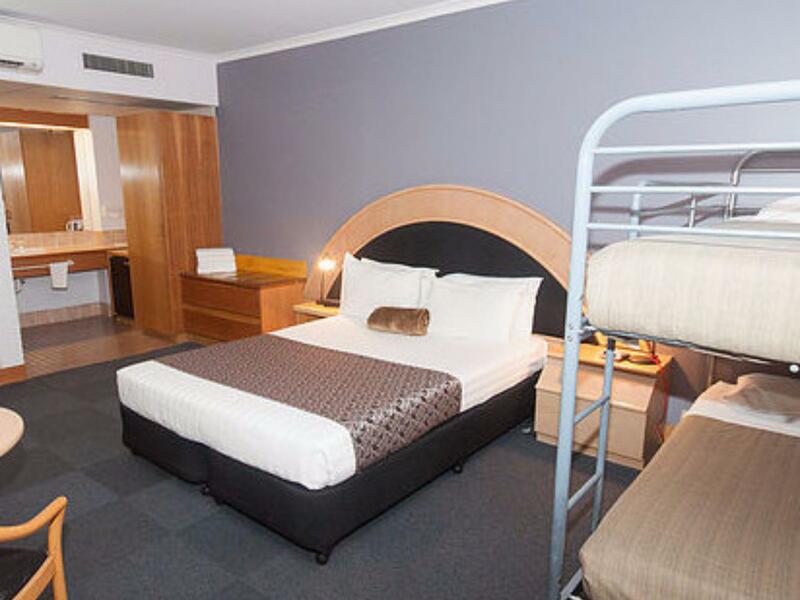 We stayed there because of the easy location in Queanbeyan. The room was a basic room which offered tea and coffee making facilities. The shower was great and the bathroom basin was outside the bathroom which alloweed my wife to easily use the basin in plenty of light while I was in the shower without fogging up the mirror. Check in and check out was quite easy. The location was less than 20 minutes to Canberra. The hotel was quiet however in the early morning there was a hum from an aircoditioning unit in another room which became annoying. For value for money we would stay there again. We were very surprised that the hotel room standard was not near 3.5 stars. It was not worth the money we spent. Got to check in early as the people the night before hadn't shown which was a big plus. We travelled with three children (3.5yrs, 2yrs and 10months). Plenty of room for the portacot and the bunks had high sides for the top bed so our 3.5yr old was happy and safe. Bed was comfy for us and although it was one room it didn't feel particularly cramped. 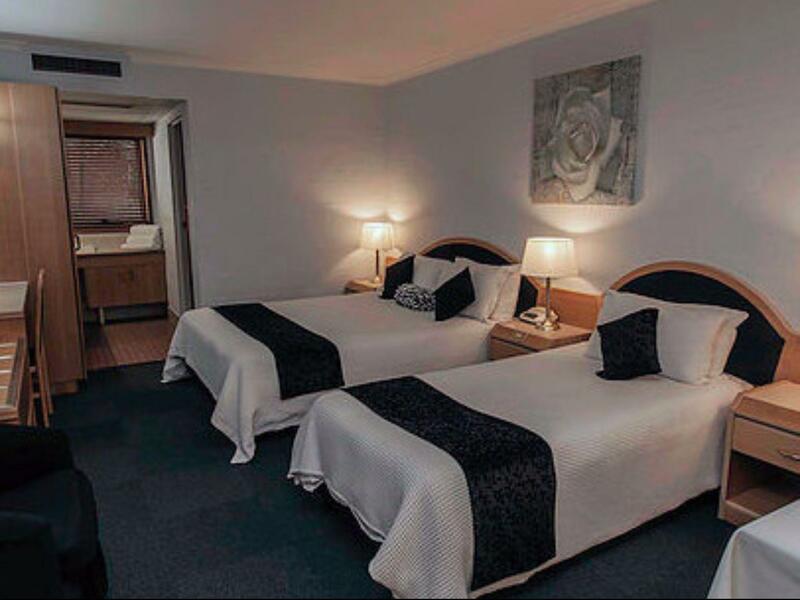 Would highly recommend for families visiting Canberra as accomodation can get very expensive and it's a quick drive into town. Also has takeaway options closeby (dominoes, KFC, maccas and red roster) if like us you needed a quick meal to get the kids to bed. It's a small shower bath but water was hot and there was a small tiled wash basin/kitchenette area outside the bathrrom where the kids could be dried off easily. Decent jug and four mugs (but only two spoons?) and actually nice instant coffee (not nescafe) including decaf which was greatly appreciated! Small fridge but no microwave. Random plants in foyer but kids thought it was cool. Other reviews said smell and mould but we didn't notice any in our stay. Easy access to and from room made getting in and out with all our stuff and the kids very easy. Will definitely stay again for the overnight trip.